By 2019, the global shampoo market is expected to reach an estimated value of $25.73 billion. 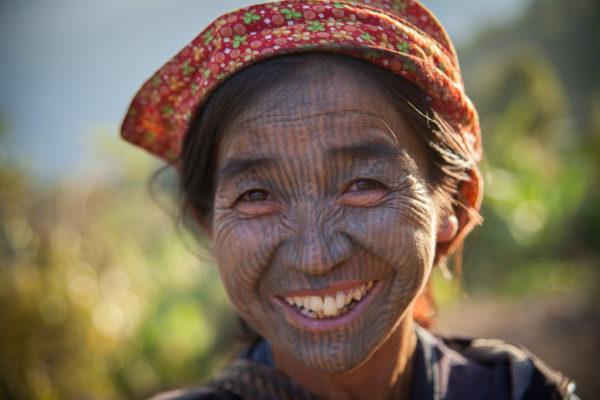 But deep in the mountains of southern China’s Guangxi province, the women of Huangluo Village won’t be contributing a single dime to the industry– because apparently, it’s not worth it … (sorry L’Oréal). 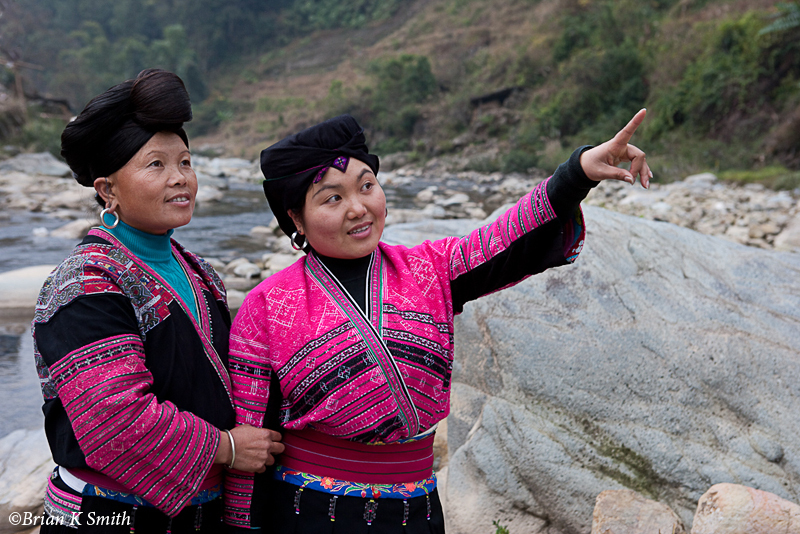 For the Yao minority of ethnic women, hair is their most prized possession. 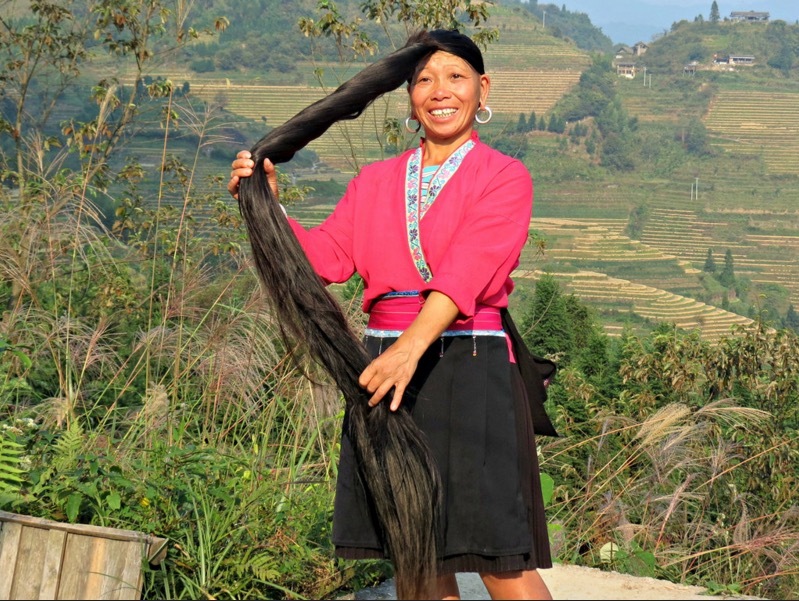 The ancient settlement is known across China as the “Long Hair Village” and is even recognised by the Guinness world book of records as the “world’s longest hair village”. They grow their jet black hair up to 2.1 meters (6.8 feet) long, and manage to keep it looking strong and healthy (and free of greys) well into their old age. Their secret? They wash with fermented rice water. You know, that milky-colored liquid left over from rinsing or boiling rice. 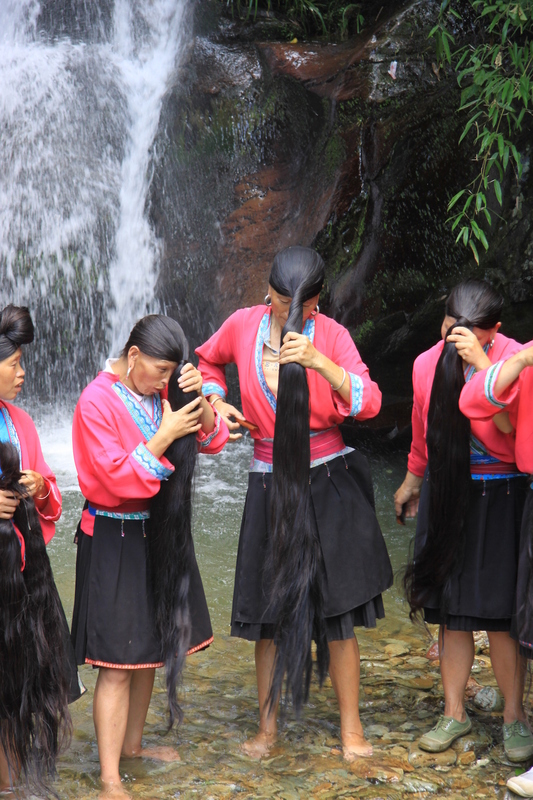 It’s been the secret to beautiful hair for these village women as well as imperial princesses in the East since ancient times. 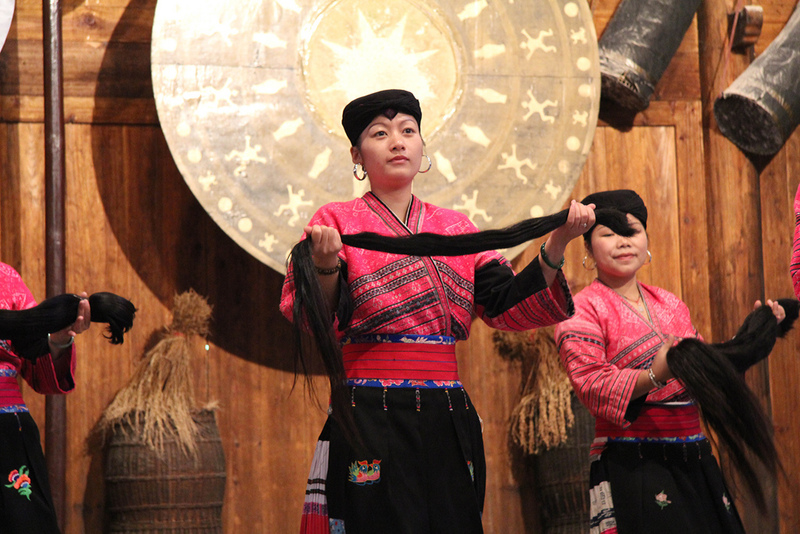 Hair has always been a big deal for the Red Yao women of Huangluo, who get their name from the traditional red clothing. 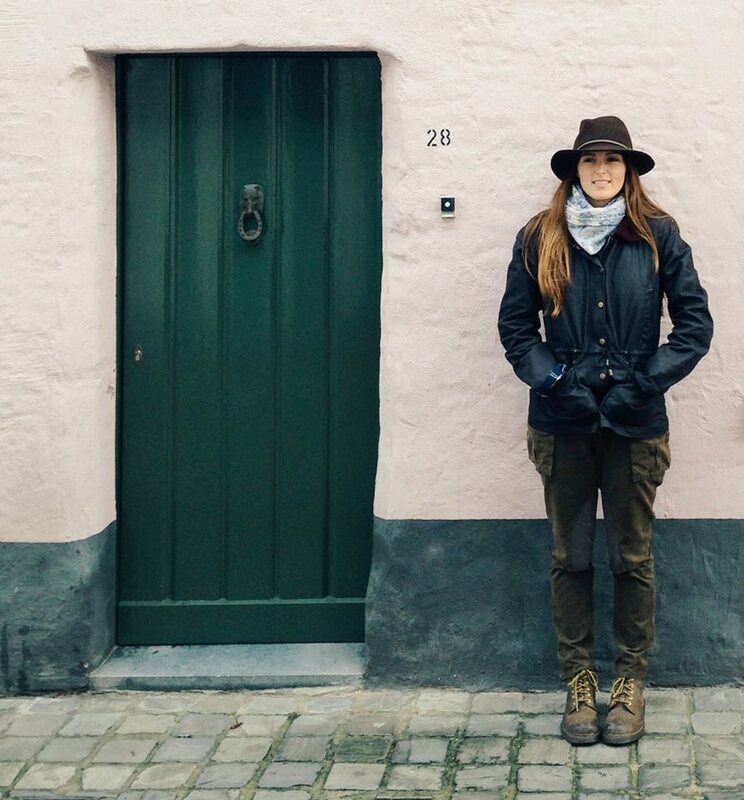 You thought you knew someone truly obsessed with their own hair? 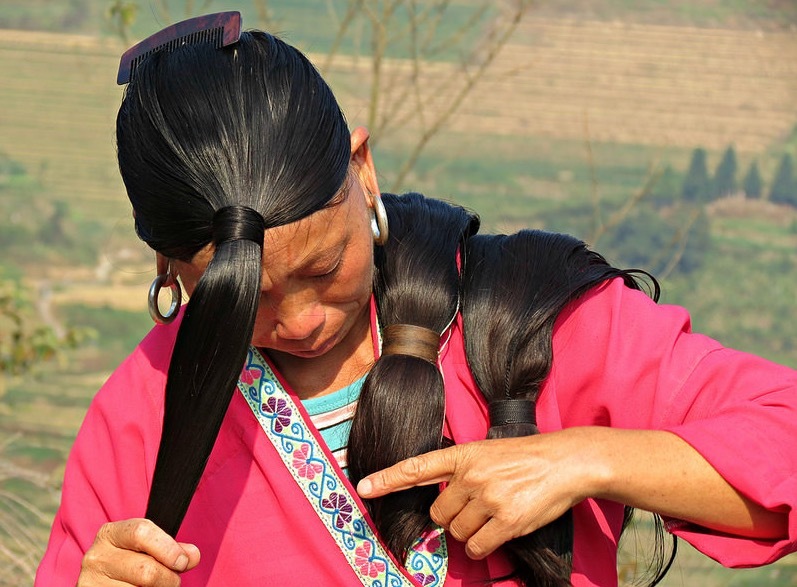 In Huangluo, it’s considered so sacred that until recently, no one was allowed even so much as to look at a woman’s loose locks except her husband and children. Hair swishing in public was a major ‘no no’, to the extent that if a local outside the marital home, or a foreign traveler caught a glimpse, they would be forced to spend three years with the woman’s family as their son-in-law. These outdated rules were scrapped in the late 1980s, presumably as the influx of tourism to the region became a source of income for the remote village, once among the poorest in the province. This is no longer the case for Huangluo, and it’s all finally fitting in rather well with the ancient belief that growing their hair long brings longevity, wealth and good fortune. The longer the hair, the more fortunate one will be. 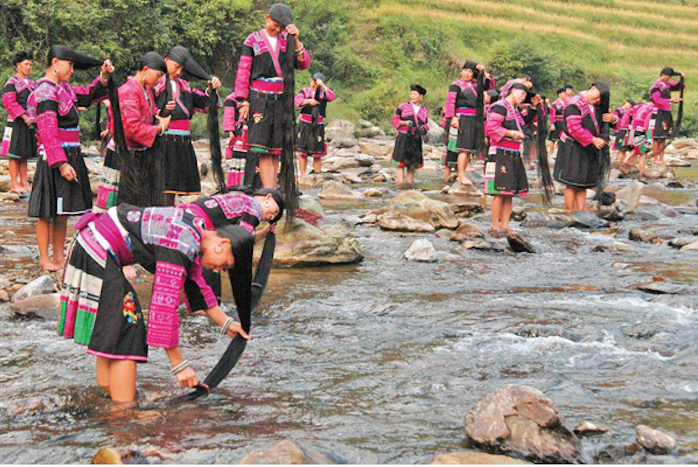 Alongside normal day jobs and duties in the village of 82 households and 400 villagers, women with Rapunzel-esque hair will sing and perform in groups several times a day, displaying their long hair for tourists, earning over $300 a month during his season. 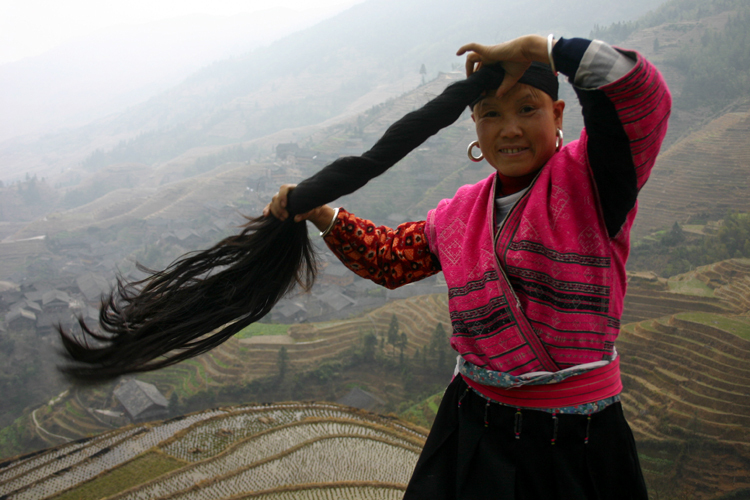 The women of Huangluo can only cut their hair once in their lives, on their 18th birthday. But the chopped hair isn’t exactly sold off only to find its way into a packet of Kardashian brand hair extensions. 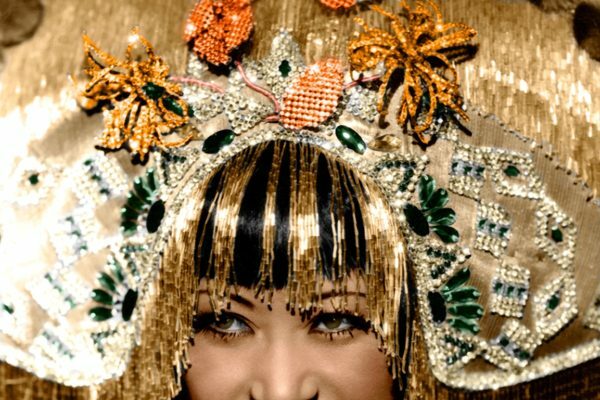 Here, it’s given to the girl’s grandmother and made into an ornamental headpiece. It’s ironically at this time, with an ear-length haircut that the young woman is supposed to begin looking for a lover. When she marries, the hair is gifted to the groom, and later becomes a part of her everyday hairdo. 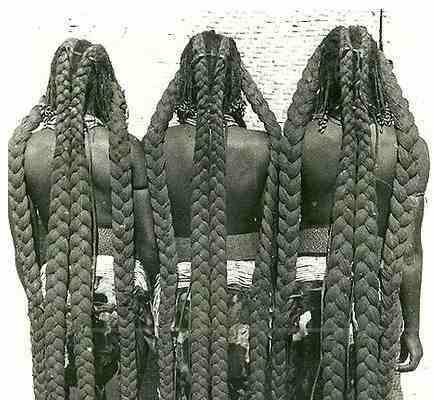 In fact, one might even say that the idea of hair extensions originally came from the Red Yao women, whose hair is actually made of three bunches: her own hair, the hair from before her wedding, and the third is made from the falling strings of hair, which are collected and and cared for every day. All three come together to form an elaborate expertly wrapped hairstyle. Different hairstyles also represent the different social status of the bearer. 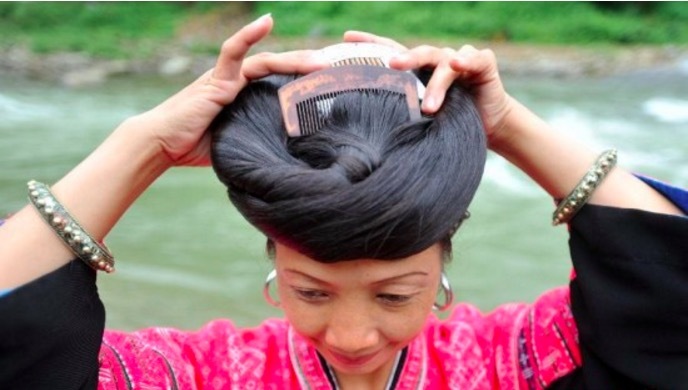 For example, if the hair is wrapped like a circular tray on top of her head, it means she is married but has no children. If she is married with children, she’ll wear a bun at the front of her wrapped style– perhaps to represent a baby bump? I’d like to think it’s a play on “bun in the oven”! If she wears a scarf around her head, with her hair remaining hidden, it means she is looking for a husband, who traditionally, would be the only man with the privilege to see her hair in all its beauty. Nowadays, once she’s married at least, the people of Huangluo seem to be a little more comfortable with sharing that beauty with the world. So about that ancient shampoo. Essentially, it’s fermented rice water that has gone slightly sour. Rich in antioxidants, minerals, vitamin E, washing your hair with the stuff will make it shiny, soft, strong and healthy. It’s also known to help to heal scars and reduce fine lines, and inflammation, “leaving the skin with a healthy glow”. Okay, I’m starting to sound like a beauty column. 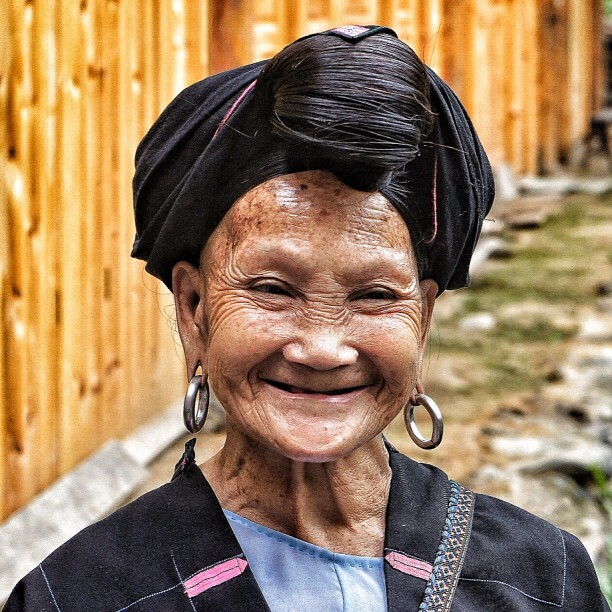 But seriously, Red Yao women claim that most of them don’t see a single grey hair until well past the age of 80. A New York-based natural health consultant, Dr. Margaret Trey decided to give rice water a go and noticed that it cleaned her hair well without drying it out, noticing that it also felt strong, softer and more manageable. Now a regular user of rice water, she finds that when she occasionally goes back to a commercial-brand shampoo, her hair is immediately stripped of its natural oils and becomes “wispy and almost too fragile to brush” and then has to use a hair-repairing product to moisturise it. (I might be losing the guys at this point). But for those of you willing to try out this ancient hair-washing method (because you’re worth it), here’s a few tips on how to make the Red Yao shampoo. It’s pretty simple. First, collect the rice water (not the water you use on the initial rinse to get off any dirt). 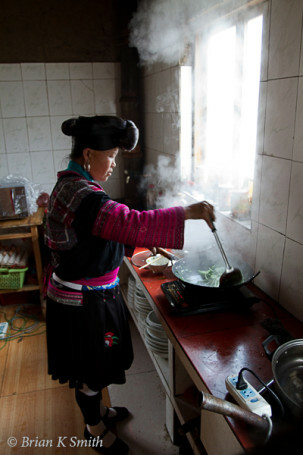 “If you cook rice two to three times a week, you should be able to collect enough rice water for two to three rice-water hair washes”, notes Dr. Taylor. 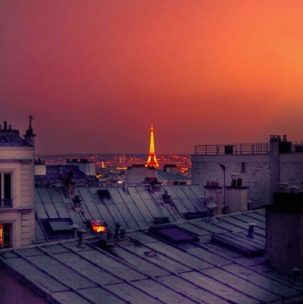 She even suggests making friends with the staff at your favorite Chinese or Asian restaurant and bringing a plastic container to add to your stock! Then leave the rice water at room temperature for a day or until it turns slightly sour and starts to ferment. Boil it, then allow to cool and maybe add a few drops of tea tree, lavender or rosemary essential oils and store it in the refrigerator. A 60-fluid-ounce container will usually last about a week and you can use the rest for a daily face wash.
Needless to say, I’m washing my hair with this stuff tonight. 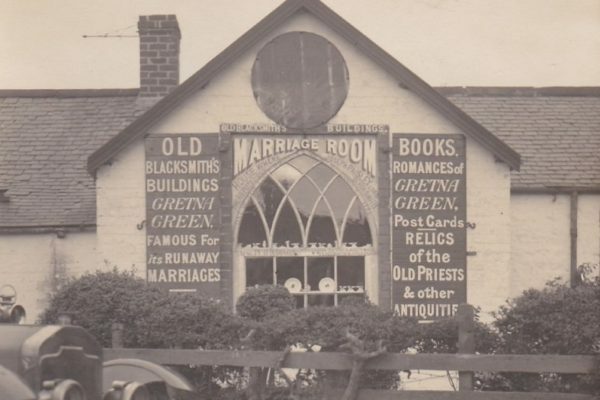 Won’t Someone Save this Scandalously Forgotten Chateau?